Running is an incredibly open and inclusive sport. Technically, all you need to join in is a pair of sneakers and a willingness to put one foot in front of the other. Even for those with disabilities that seem prohibitive to pounding the pavement, where there’s a will, there’s a way. This weekend’s United Airlines New York City Half Marathon proved that again with an exciting run for the record books. 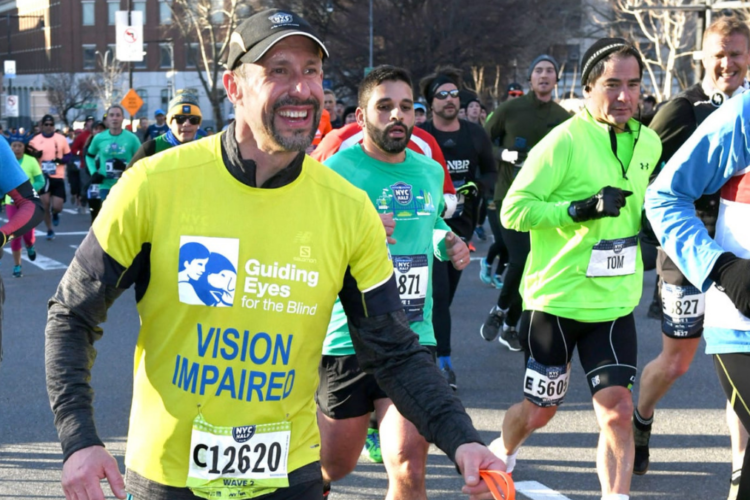 This year was the first time a blind runner participated in the race with the help of a relay team of running guide dogs instead of human guides. The runner was Thomas Panek, and he not only ran the race but finished it proudly. Panek is the president and CEO of Guiding Eyes for the Blind, the nonprofit that trained his team of running dogs. 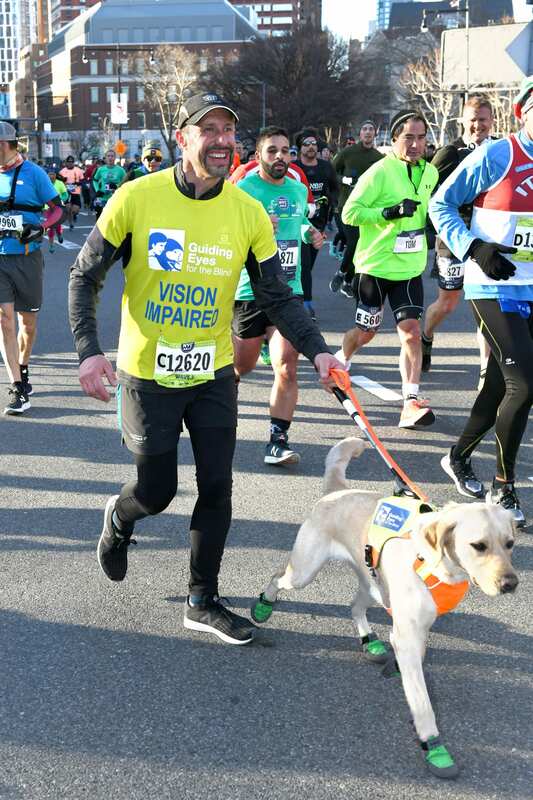 He ran on St. Patrick’s Day to raise awareness and funds to provide other athletes who are blind with a versatile service dog capable of both guiding and running. As an accomplished distance runner who also happens to be blind, Panek knows firsthand what a dog like this can bring to someone’s life. Panek ran the 13.1-mile course with his trio of furry friends — three Labrador Retrievers — leading the way. His crew included Waffle (yellow lab), Westley (black lab) and Gus (yellow lab). It wasn’t this four-legged crew’s first race, though. These dogs are an accomplished bunch. 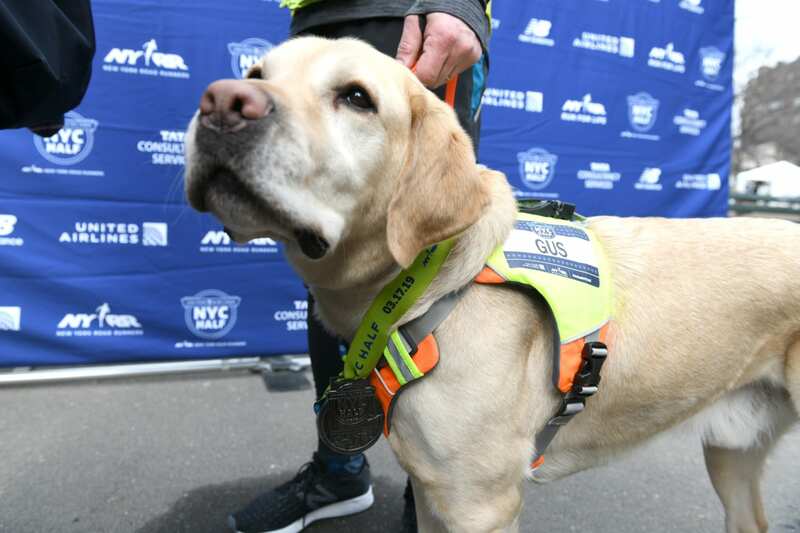 Gus happens to be the first running guide dog to complete the NYRR and Boston Athletic Association Event as a running guide. As a result, he earned the coveted last leg of the race. He paced Panek for the final 5K and, ultimately, across the finish line. This race marks Gus’ last as Panek’s personal guide dog and running partner. He officially retired after crossing the finish line and traded in his Ruffwear UniFly™ Guide Dog Harness for a medal. All along the course, Panek, volunteers and vets paid close attention to the dogs’ health and well-being. They checked them along the route to ensure they were hydrating properly and staying safe. The dogs also wear specials shoes to protect their paws from the pavement. For this particular race, it was a crisp, cool morning perfect for a speedy run through New York City. Panek and his guide pups crossed the finish line with a time of 2 hours, 20 minutes and 51 seconds. It was a proper send-off for Gus and proud moment for Guiding Eyes for the Blind.